Damascus Theatre Company is dedicated to bringing good family entertainment to upper Montgomery County, Maryland. We perform large Broadway musicals every fall, smaller musical shows every spring or summer, and our DTC Kids musical in the spring. DTC is proud to be able to present live entertainment performed by the community for the community. 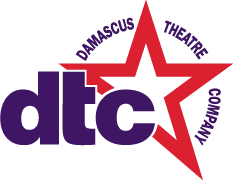 Since 1985, DTC has been offering family entertainment to residents of Damascus and surrounding areas, while providing a vehicle for people of all ages interested in community theater to share their time and talents on a volunteer basis. We would like to thank the Damascus community, area businesses, and our loyal audiences for their continued support of this effort. The Damascus Theatre Company, Inc. was founded in 1985 by two Damascus residents, Jeannine (Jacobs) Wood and Maria Stanton, who wanted to bring live family entertainment to the community. With seed money and sponsorship provided by the Montgomery County Recreation Department and with generous support from area residents and businesses, the company has grown to approximately 200 members and looks forward to continued growth and expansion. The company’s first production was an original play entitled “On The Road To Damascus.” Since then, DTC has performed many of the most beloved musicals. For a complete list of past shows, please click here. The Damascus Theatre Company began as a dinner theater. Our first performance was held in the Damascus High School auditorium. The dinner was served in the Damascus High School cafeteria. The food was prepared by the Women’s Auxiliary Firemen’s Association. In 1987, we moved from the Damascus High School auditorium to the Damascus Firemen’s Hall. As the hall had no stage, a complete stage was built every year by the members of the theater company. Food was still prepared by the Women’s Auxiliary Firemen’s Association. From 1990-2003, we moved back to the Damascus High School auditorium for our fall musicals. In 1994, we decided to also perform a smaller show in the spring, and we brought back the dinner theater for a few years. In 2004, we formed a partnership with the Gaithersburg Arts Barn, and our spring show has been a more traditional musical performed in this great space. From 2004 until 2006, DTC had the opportunity to have its own home in a storefront and our shows were performed in this facility, the Damascus Performing Arts Center. Starting in the fall of 2008, we began performing our fall musical at the Carl M. Freeman Auditorium in Olney (formerly the Historic State at Olney Theatre). The Damascus Theatre Company, Inc. depends on community support. If you are interested in being a part of community theatre in the Damascus area, either on stage or behind the scenes, please contact us. We’d love to have you join us. Send us an e-mail or write to us at Damascus Theatre Company, Inc., P. O. Box 185, Damascus, Maryland 20872.